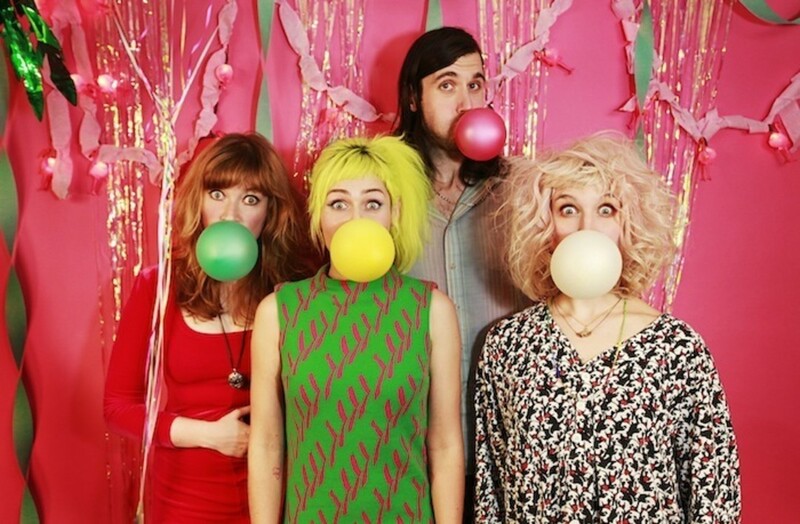 The singer chats about candy stoners, zombie bras, and Tacocat's new LP NVM. Tacocat. Their flavor sounds way cooler than Cherry Garcia. When Emily Nokes isn't working her day job as The Stranger's music editor, she's often busy making some of the funnest, poppiest tunes in Seattle as the singer/tambourine queen of Tacocat. In typical Tacocat fashion, the group's new Hardly Art LP NVM is loaded with humorous and upbeat songs about "that time of the month," Magic Eye images, and acting out in the name of anarchy (while not really being an anarchist). The band celebrates NVM with a Valentine's Day release show at Chop Suey next Friday, so take a date or go stag and let the album fill the hole in your heart with unmitigated glee. For our latest Fiendish Conversation, we chatted with Nokes about NVM, gummy bears, and Tacocat's official preshow smoking regulations. One of the things I enjoy about NVM, as with previous Tacocat releases, is that you have a lot of random song topics; from Tonya Harding to cats to periods to all sorts of other things. Is there anything that you want to write a song about but you haven’t been able to crack its songwriting code yet? We do have ideas for songs all the time… I feel like when we’re in the van on tour we’re just constantly throwing around the craziest ideas. A lot of the songs that we haven’t written are more pointed ones—like (about) ex-co-workers or some more specific ones—that when we actually sit down we’re like “Aww, that’s too mean,” or “Aww, they’re going to know it’s us,” or like “Oh, I don’t want to get fired.” When I used to work as a barista, I really wanted to write a song about how sometimes I would give people decaf at like 5:30 in the morning if they were really rude to me, but I didn’t ever end up writing that. Lelah wants to write one soon called “Zombie Bra” that’s about how you just keep wearing the same bra even though it doesn’t function anymore, and like the wires are popping out of it, but you just can’t throw it away because you haven’t been to the store lately. So that might be coming up. I’ll look for it on the horizon. Is there any specific aspect about the NVM that you’re particularly excited about? I’m just really excited that we have another full length album finally. Our first album ever was like five years ago and was the full length, and in between then we’ve just been doing like tons of 7-inches and splits. We keep writing full albums and then kind of keep splitting them in half, you know, just in the manner of “Oh, this is easier; it’ll be faster to get these out.” So I’m really excited to have a final big collection of songs all together at once. Finally! One of Tacocat’s signature traits is a stoner mentality. I mean, you’ve won a High Times award. What do you think is difference between your short poppy brand of stoner music and the long, drawn out jam band stoner style? Are you just smoking different strains? Well now that I’ve learned more about marijuana, now that everything’s legal, it could be the kind (we’re smoking). It seems we’re more on the fence of the sunny kind of weed, the kind where you just feel awake and everything is just so funny. When we’re together and we’re getting stoned, it’s just like we can’t stop giggling, we can’t stop talking, we can’t stop just like riffing on things, we can’t stop eating candy; it’s definitely more of like a sugar buzz and not more of that surge stoner metal or anything like that. I think ours is just more short bursts of more candy. Candy stoners. Does your job as the music editor at The Stranger change your approach to music at all? If you weren’t a musician and writer, is there another line of work you’d want to pursue? Well I’ve always been really interested in candy tasting. And I know that would maybe just say that, but I feel like I can taste… I don’t know, like have a better appreciation for it or something. People sometimes tell me that they don’t think that gummy bears even have different flavors, which I think is ridiculous. You just have a refined palate when it comes to sugar. Does Tacocat have any preshow routines? I guess that we’re usually a little disorganized, so sometimes we have to cram a practice in before we play, which I’ve heard other bands say that they definitely would not do that, but it kinda helps us loosen up a little. Ummm I like to… only two of us are allowed to smoke weed before we go on or it’s a disaster. (Laughs) So usually it’s like after we play, then you’re kinda free to get loose. Tacocat’s preshow routine is usually putting on tons and tons of glitter… it’s sort of miraculous; we’ll all show up to the show wearing really similar outfits like no matter what. Like one’s wearing all blue, one’s wearing all red… so it’s sort of a little hair and lipstick festival, because we really just try to just pile it on before, um yeah. So was there a trial and error process to determine which Tacocats were allowed to smoke preshow?